Amalfi Pizza brings another take on the popular pie to Atlanta's office and nightlife denizens. : A pair of 6,000-pound wood-burning ovens that had to be lifted by cranes into position provide the visual and operative focus of this authentic Neapolitan pizzeria. The stairway leading to the upstairs 170-seat dining space is painted to suggest an Italian stairscape. Co-founders Stephen de Haan and Greg Grant staged with pizza masters in Italy and then studied with the Associazione Verace Pizza Napoletana. The ovens take the temperature to extreme levels so the pizzas cook very quickly and achieve the lovely blistered skin quality that enhances flavor. Share a caprese appetizer made with mozzarella di bufala, a detail not often seen in Atlanta pizza parlors. 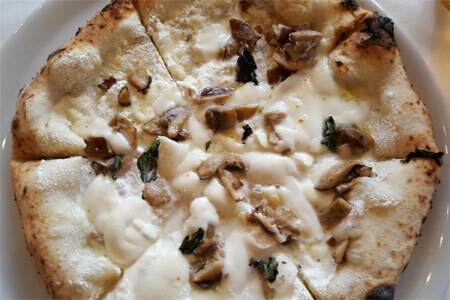 Our pizza with truffle and mushrooms (tartufo e funghi) was a hit. We also recommend the pizza carnevale, with cut edges folded over ingredients designed to resemble an Italian carnival mask; the trick encloses cheese and meat and is plenty for two, as are the regular pizzas. For dessert, there are serviceable cannoli and tiramisu. Consider a beer to complement the food. Service is amiable.